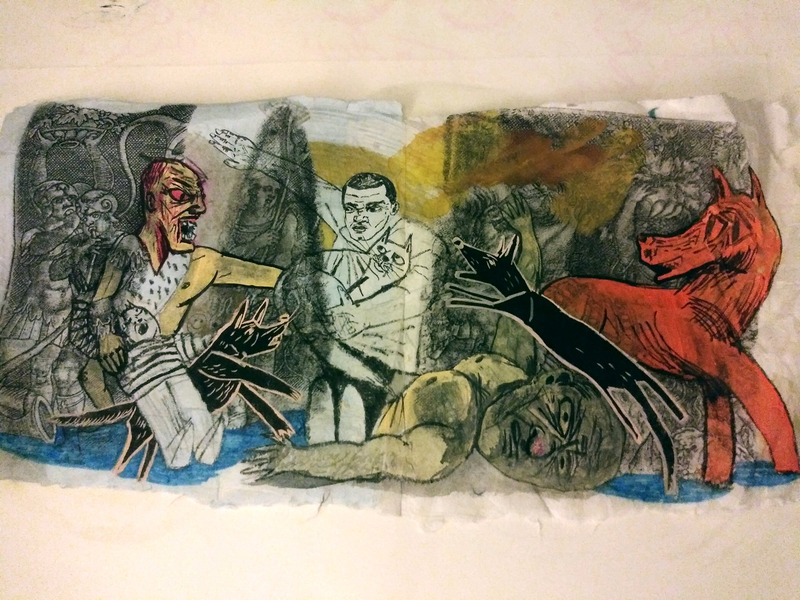 Kala Gallery is proud to present the exhibition Turning Tales featuring the 2017-2018 Kala Veterans Residency Program artists Adam Allegro, Fanny Garcia, Roger Ourthiague Jr., Gregory Rick and Ehren Tool with special guests Amber Hoy, and Aaron Hughes & Amber Ginsburg. The Veterans Residency Program is a new initiative at Kala Art Institute started in 2017 with support from the California Arts Council (CAC). Its goal is to encourage and support the artistic expression of veterans and the extended veteran community, and to create public dialogue and appreciation for the diverse range of veterans’ experiences. Veterans have experienced many conflict zones. While on active duty, they were in the midst of war and combat zones. Returning to civilian life, they carry back their experiences and also face a new conflict between military and civilian life. These conflicts become the part of their lives – past, present, and future. The exhibition Turning Tales creates a place where veteran artists share their stories with fellow artists, gallery visitors and the extended community. 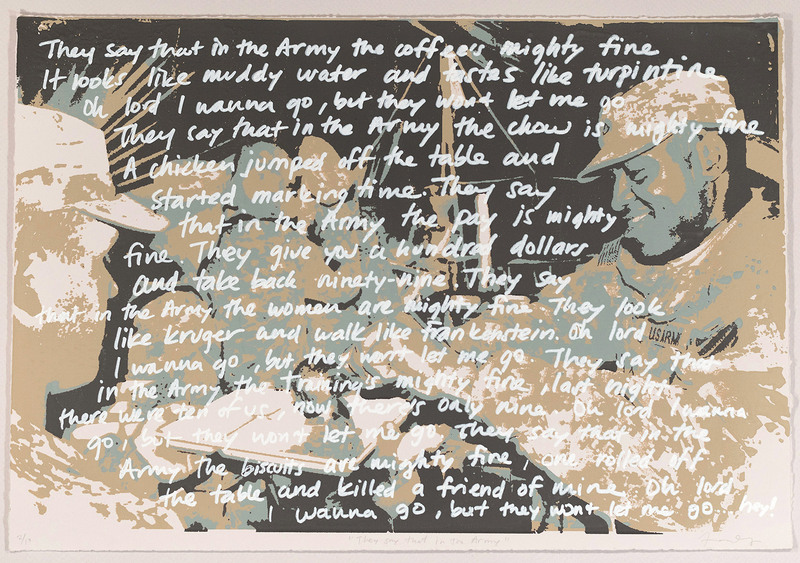 The exhibition focuses on their creative journey from military duty to civilian artist as each artist conveys messages, stories, and experiences through their art practice. War, military action, and veterans’ experiences often become invisible and separate from the civilians’ lives. Topics touched on include power structure within the military system, struggle and conflict of individualism, technology and development of mass destruction, surveillance, detention and torture, and beliefs, honor, shame and guilt around war, violence, and military service. 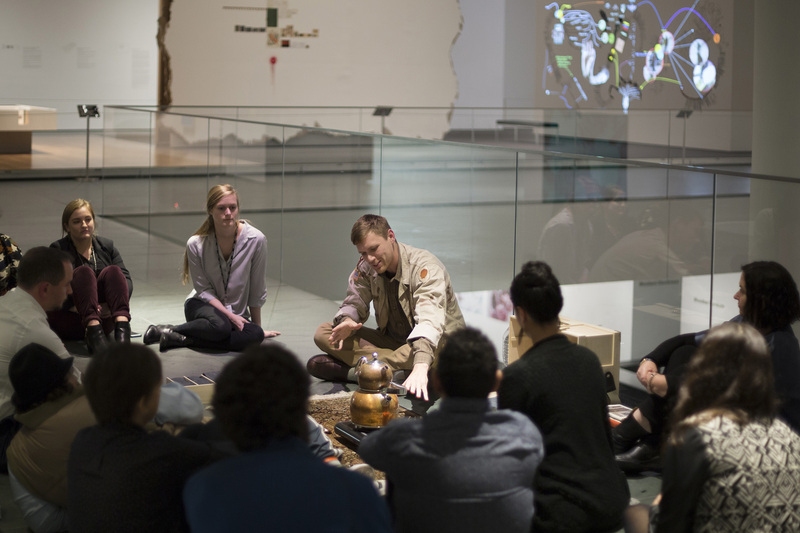 With additional support from CAC and UC Berkeley Chancellor’s Community Partnership Fund, Kala is working in collaboration with Cal Veteran Services Center on creating engaging and accessible public programs to complement this exhibition. 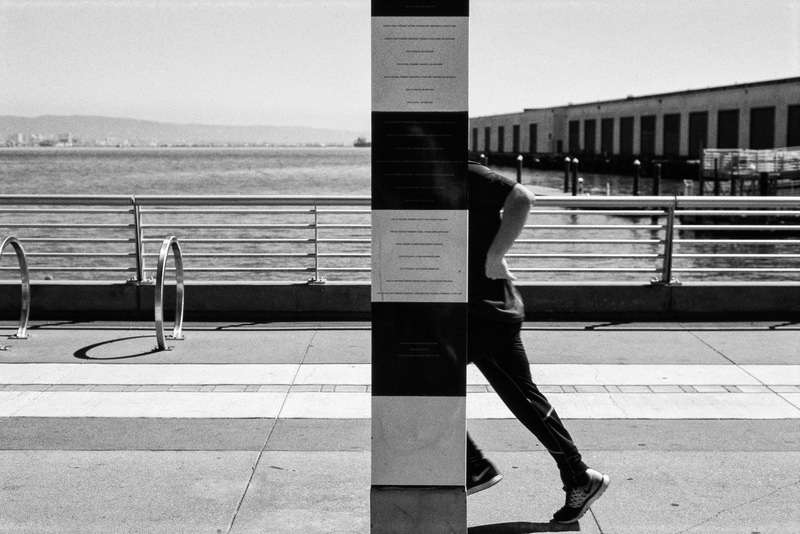 Photography allows Adam Allegro to slow down and to explore his relationship to the world around him. “As a veteran trying to understand the world that surrounds me, I often feel isolated from others ‐ an outsider peering in. In an attempt to better understand, I look for a deeper meaning through the act of photography.” Allegro captures scenes where the overt is obscured and the sceneries become ambiguous. 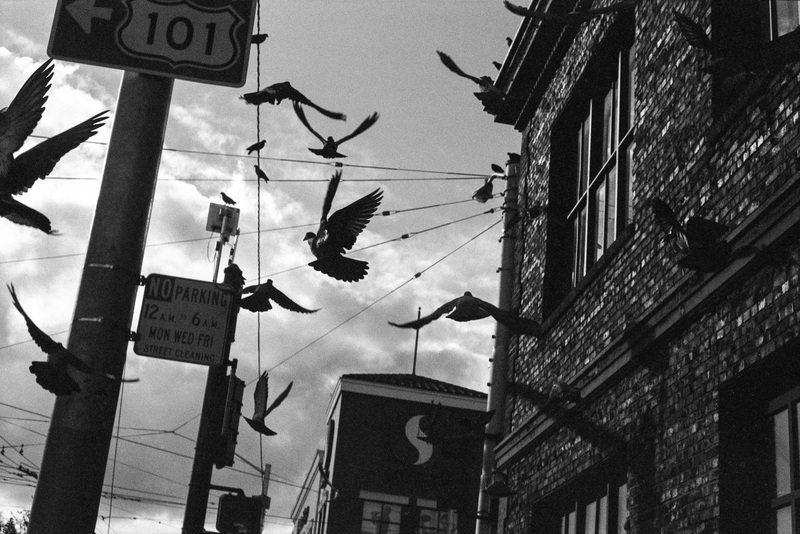 His photographs suggest that the world is not binary and there is a room for creative interpretations and dialogue. 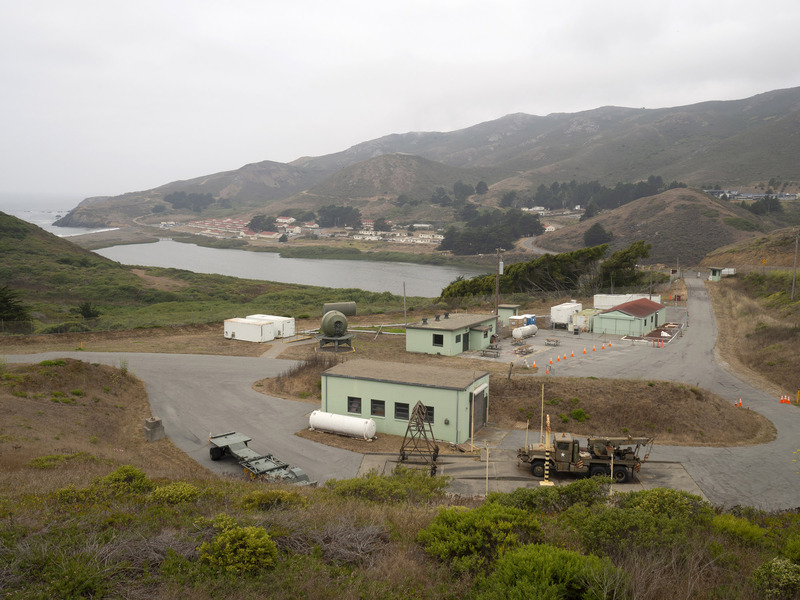 Amber Hoy’s work explores questions of military service through the use of photographs, storytelling and abstractions. 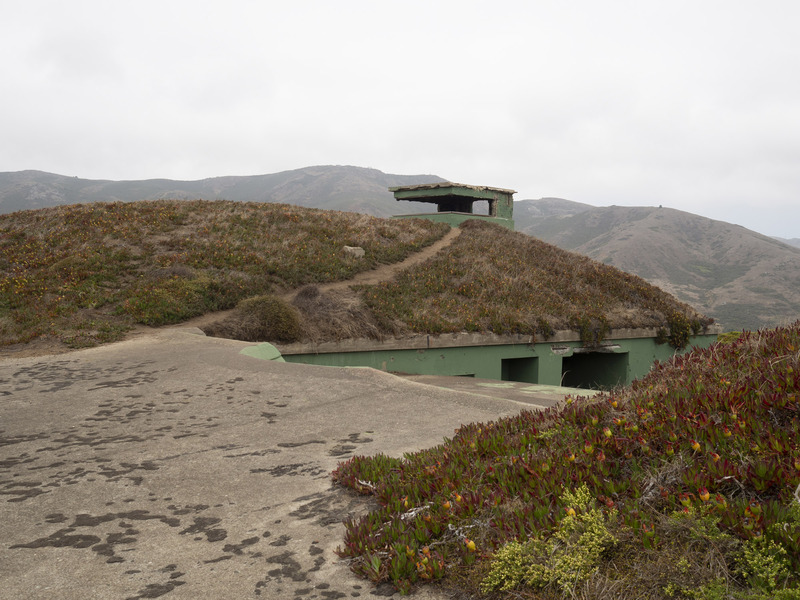 She captures in-between space of the stories told and untold, pictures photographed and not photographed, the gap between military life and civilian life, and history of military sites in the present and in the past. 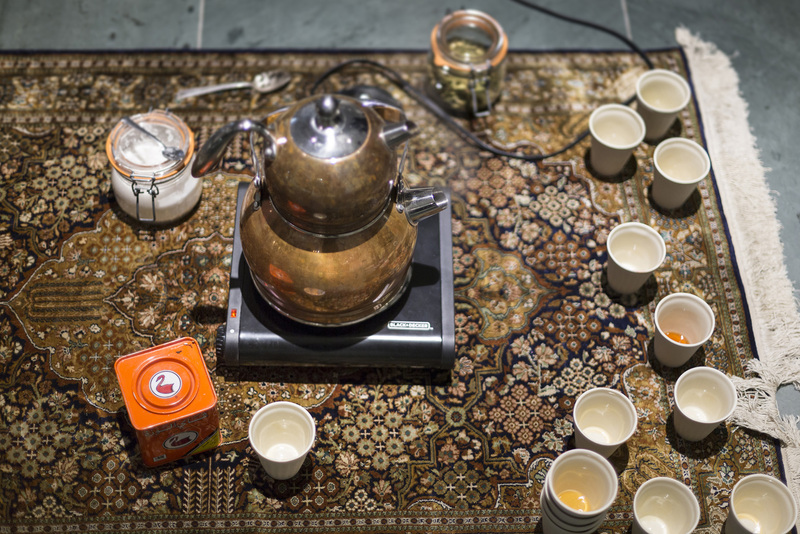 For Turning Tales, Amber Ginsburg and Aaron Hughes present Tea Project, a collaborative multi-faceted project that formulates conversations with the audience about their relationship to love, war, detention, torture and humanity. Displayed in the gallery are nine porcelain cast Styrofoam teacups; one teacup for each of the nine individuals that have died while detained at Guantanamo Bay Detention Camp. 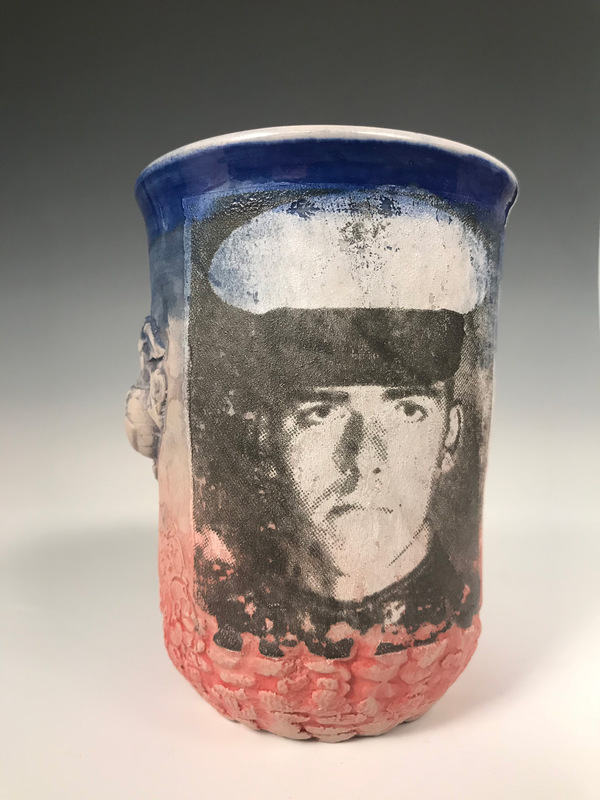 Inspired by Hughes’ friend Chris Arendt, a Guantanamo Detention Camp guard, who fell in love with drawings carved by detainees into Styrofoam cups, Hughes and Ginsburg cast 779 porcelain Styrofoam teacups, one for each individual held in extra-legal detention since 2001. 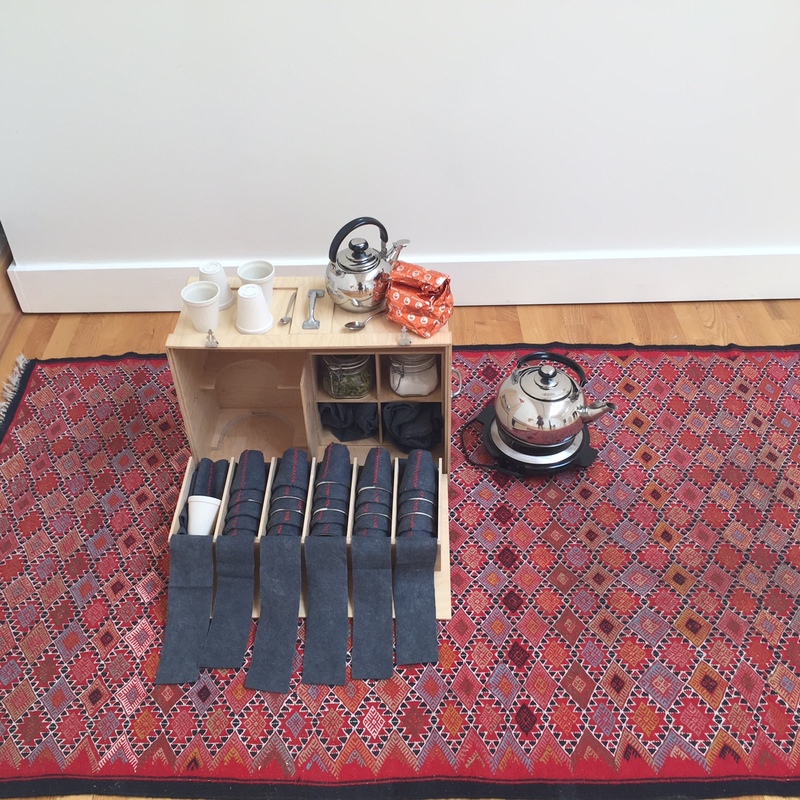 In addition to the work in the gallery, Aaron Hughes will host a tea performance on Friday, October 19 at 7pm, and an artist talk and tea performance on Saturday, October 20 at 1pm (limited to 25 for each performance). RSVP on Eventbrite required for tea performance. Roger Ourthiague Jr’s mixed media installation in Turning Tales explores his personal conflict between “Honorable discharge” and “Other Than Honorable (discharge).” Through his residency process and time in the studio, Ourthiague turned his negative perception to a positive impact on his wellbeing. His drawing Propaganda Goats (Curation #1) is a series of non-narrative comics with texts constructed by conflicting messages that Ourthiague received during his service and in civilian life afterwards. He illustrates the confusion people face when they hear messages shifting over time for different reasons. Art making is an anchor in Gregory Rick’s life. Since receiving two books: one on art and the other on history from his farther who went to prison when Rick was seven, making art became his passion and outlet for overcoming hardships such as returning from Iraq and dealing with feelings of guilt. 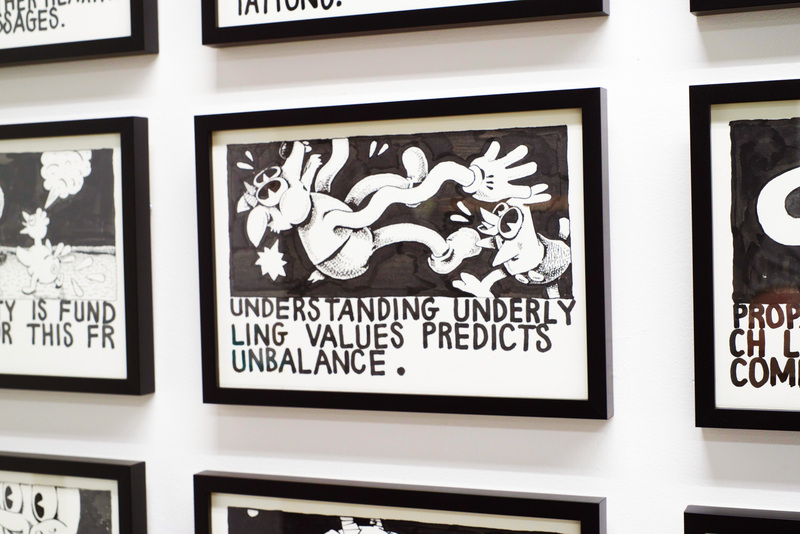 Rick creates works on paper, full of social commentary with repeated motifs and symbols. 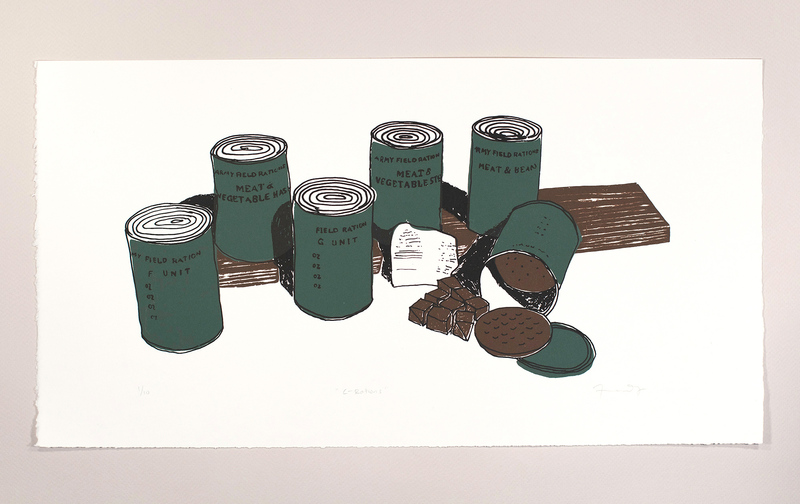 For Turning Tales, he presents drawings, paintings, prints and handmade books that he produces responding to his everyday surroundings. Ehren Tool says “I just make cups.” As a ceramic artist and Senior Laboratory Mechanician at the Ceramic Department at University of California, Berkeley, and Marine Veteran of the 1991 Gulf War, Tool has made and given away over 15,000 cups since 2001. 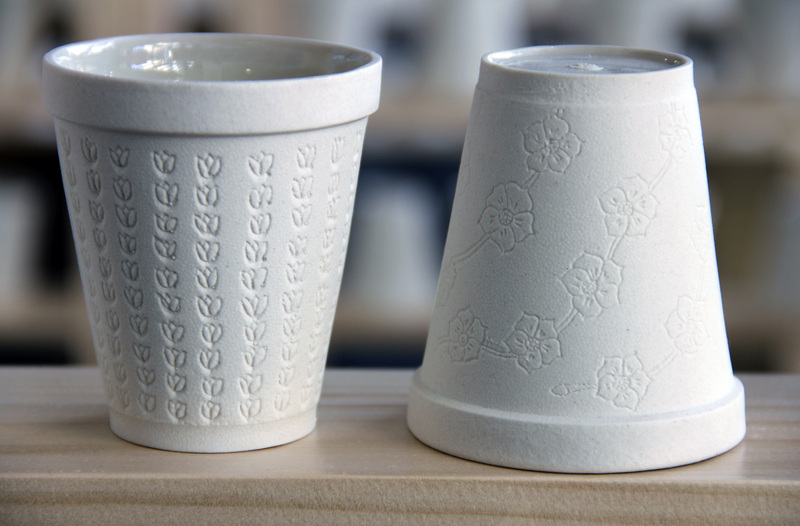 Each of his cups contains a story with images that are sometimes hard to look at. “I hope that some of the cups can be starting points for conversations about unspeakable things. I hope conversations flourish between veterans and the people who are close to them. I also hope that some honest conversation can happen about war and its causes.” Tool will be giving an artist talk on Saturday December 15 at 2pm and giving away his cups on display.